Bought these for my 10 speed commuter, after great experience with the 11-speed KMC link on my weekend machine. Makes cleaning the chain a pleasurable, no fuss experience, without any mess. Just literally 2 seconds to under the special link to remove chain for cleaning, and then another 2 seconds to refit, with no need for tricky chain breaker tools and special shimano pins. Have found the KMC links work very well with other brands of chain. Easy to stick on, and easy to unhook chain for a good deep clean. Highly recommend these lil' bad boys. Was the right price and I could afford to wait for the postage also. I think these things are so simple but so so useful. I would never use a chain without fitting one of these first. Always use these kmc links. Easy to use and great to have as spares out on the road in case your chain snaps. Essential to have on you for any extended ride in case the chain snaps. Really easy to use. Best price online at point of purchase. Always nice to have a couple of quick links in the tool bag! Unfortunately they won't be with me long as it seems I always go riding with other people who break their chain and need my links. These are a bulletproof, quick way to join a chain! Far easier way to join my chain than the pins supplied by the manufacturer. And makes it easy to take the chain off for cleaning. I carry a spare in my saddle bag for any unplanned mid-ride repairs. Best way of installing and removing the chain, and you can remove and join chain without tools. Now that I have started some longer rides, purchased just for comfort of knowing had these as a back, Arrived promptly and fit into rescue box snugly. Yet to need but good to know they are there. Best links on the market. Just the easiest, quickest connector. Unclick, chain off, in jar, degreaser, chain perfectly clean, refit and just snap together. Perfect. Never had a problem with any of these, excellent bits. Work really well but not too difficult to take apart for chain cleaning, always have a spare just in case. Always use these quick links on my chains to make cleaning easier. Easy to get on and off. Great missing links / quick links. 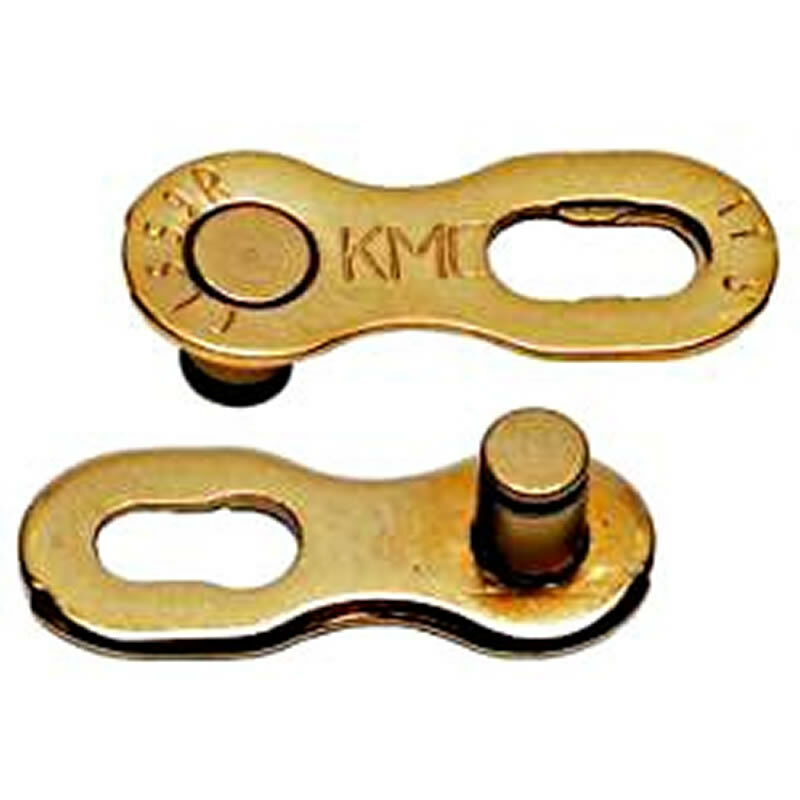 The only ones I have known to work with my KMC 10spd chains - sounds obvious? It isn't. I've ordered other "KMC" missing links elsewhere (ebay) that haven't fitted which resulted in lost time in competition! Buy these originals in the original packing to avoid disappointment! No sense trying to go cheap. Also delivered within 24 hours - so impressed all round! Just makes things easier. I've no compatibility issues with 10 speed Shimano chains and KMC links. Apart from anything else it makes lubricating the chain easier as you can easily see when you're back to the start! Note you get 2 complete links per pack.